Die Martis, 11 Maii, 1641. Speeches on Trial of Earl of Strafford. Relief of the Army, &c.
Proceedings concerning the Queen Mother. NR. Francis Buller made the Protestation. 3a vice lecta est Billa, An Act for the better Raising and Levying Mariners, Sailors, and others, for the present Guarding of the Seas, and necessary Defence of the Realm, upon Question, passed. 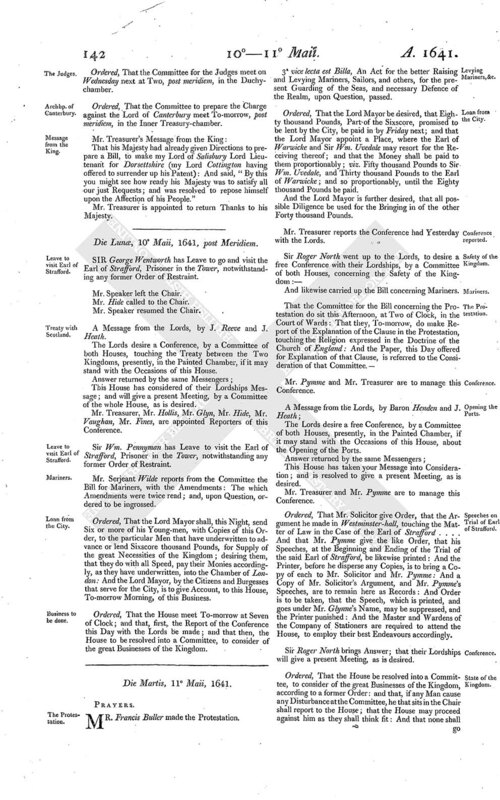 Ordered, That the Lord Mayor be desired, that Eighty thousand Pounds, Part of the Sixscore, promised to be lent by the City, be paid in by Friday next; and that the Lord Mayor appoint a Place, where the Earl of Warwicke and Sir Wm. Uvedale may resort for the Receiving thereof; and that the Money shall be paid to them proportionably; viz. Fifty thousand Pounds to Sir Wm. Uvedale, and Thirty thousand Pounds to the Earl of Warwicke; and so proportionably, until the Eighty thousand Pounds be paid. And the Lord Mayor is further desired, that all possible Diligence be used for the Bringing in of the other Forty thousand Pounds. Mr. Treasurer reports the Conference had Yesterday with the Lords. And likewise carried up the Bill concerning Mariners. Mr. Pymme and Mr. Treasurer are to manage this Conference. The Lords desire a free Conference, by a Committee of both Houses, presently, in the Painted Chamber, if it may stand with the Occasions of this House, about the Opening of the Ports. This House has taken your Message into Consideration; and is resolved to give a present Meeting, as is desired. Mr. Treasurer and Mr. Pymme are to manage this Conference. Ordered, That Mr. 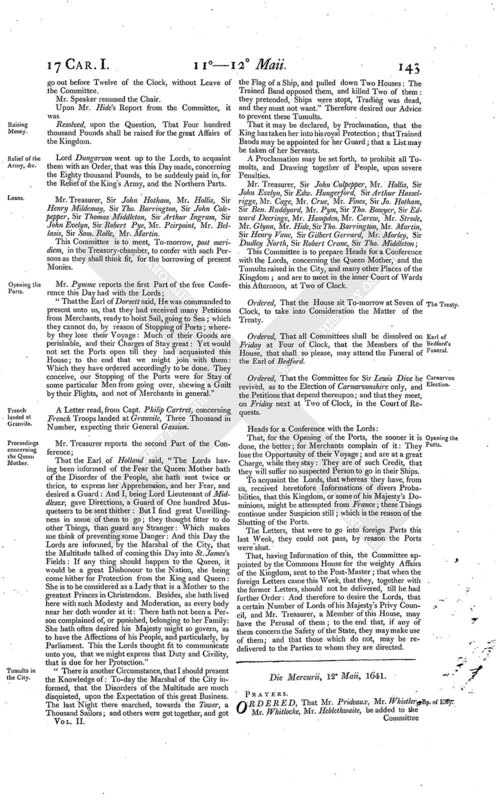 Solicitor give Order, that the Argument he made in Westminster-hall, touching the Matter of Law in the Case of the Earl of Strafford.... And that Mr. Pymme give the like Order, that his Speeches, at the Beginning and Ending of the Trial of the said Earl of Strafford, be likewise printed: And the Printer, before he disperse any Copies, is to bring a Copy of each to Mr. Solicitor and Mr. Pymme: And a Copy of Mr. Solicitor's Argument, and Mr. Pymme's Speeches, are to remain here as Records: And Order is to be taken, that the Speech, which is printed, and goes under Mr. Glynne's Name, may be suppressed, and the Printer punished: And the Master and Wardens of the Company of Stationers are required to attend the House, to employ their best Endeavours accordingly. Sir Roger North brings Answer; that their Lordships will give a present Meeting, as is desired. Ordered, That the House be resolved into a Committee, to consider of the great Businesses of the Kingdom, according to a former Order: and that, if any Man cause any Disturbance at the Committee, he that sits in the Chair shall report to the House; that the House may proceed against him as they shall think fit: And that none shall go out before Twelve of the Clock, without Leave of the Committee. Resolved, upon the Question, That Four hundred thousand Pounds shall be raised for the great Affairs of the Kingdom. Lord Dungarvon went up to the Lords, to acquaint them with an Order, that was this Day made, concerning the Eighty thousand Pounds, to be suddenly paid in, for the Relief of the King's Army, and the Northern Parts. Mr. Treasurer, Sir John Hotham, Mr. Hollis, Sir Henry Mildemay, Sir Tho. Barrington, Sir John Colepepper, Sir Thomas Middleton, Sir Arthur Ingram, Sir John Evelyn, Sir Robert Pye, Mr. Peirpoint, Mr. Bellasis, Sir Sam. Rolle, Mr. Martin. This Committee is to meet, To-morrow, post meridiem, in the Treasury-chamber, to confer with such Persons as they shall think fit, for the borrowing of present Monies. "That the Earl of Dorsett said, He was commanded to present unto us, that they had received many Petitions from Merchants, ready to hoist Sail, going to Sea; which they cannot do, by reason of Stopping of Ports; whereby they lose their Voyage: Much of their Goods are perishable, and their Charges of Stay great: Yet would not set the Ports open till they had acquainted this House; to the end that we might join with them: Which they have ordered accordingly to be done. They conceive, our Stopping of the Ports were for Stay of some particular Men from going over, shewing a Guilt by their Flights, and not of Merchants in general." A Letter read, from Capt. Philip Cartret, concerning French Troops landed at Granvile, Three Thousand in Number, expecting their General Gassion. That the Earl of Holland said, "The Lords having been informed of the Fear the Queen Mother hath of the Disorder of the People, she hath sent twice or thrice, to express her Apprehension, and her Fear, and desired a Guard: And I, being Lord Lieutenant of Middlesex; gave Directions, a Guard of One hundred Musqueteers to be sent thither: But I find great Unwillingness in some of them to go; they thought fitter to do other Things, than guard any Stranger: Which makes me think of preventing some Danger: And this Day the Lords are informed, by the Marshal of the City, that the Multitude talked of coming this Day into St. James's Fields: If any thing should happen to the Queen, it would be a great Dishonour to the Nation, she being come hither for Protection from the King and Queen: She is to be considered as a Lady that is a Mother to the greatest Princes in Christendom. Besides, she hath lived here with such Modesty and Moderation, as every body near her doth wonder at it: There hath not been a Person complained of, or punished, belonging to her Family: She hath often desired his Majesty might so govern, as to have the Affections of his People, and particularly, by Parliament. This the Lords thought fit to communicate unto you, that we might express that Duty and Civility, that is due for her Protection." "There is another Circumstance, that I should present the Knowledge of: To-day the Marshal of the City informed, that the Disorders of the Multitude are much disquieted, upon the Expectation of this great Business. The last Night there marched, towards the Tower, a Thousand Sailors; and others were got together, and got the Flag of a Ship, and pulled down Two Houses: The Trained Band opposed them, and killed Two of them: they pretended, Ships were stopt, Trading was dead, and they must not want." Therefore desired our Advice to prevent these Tumults. That it may be declared, by Proclamation, that the King has taken her into his royal Protection; that Trained Bands may be appointed for her Guard; that a List may be taken of her Servants. A Proclamation may be set forth, to prohibit all Tumults, and Drawing together of People, upon severe Penalties. This Committee is to prepare Heads for a Conference with the Lords, concerning the Queen Mother, and the Tumults raised in the City, and many other Places of the Kingdom; and are to meet in the inner Court of Wards this Afternoon, at Two of Clock. Ordered, That the House sit To-morrow at Seven of Clock, to take into Consideration the Matter of the Treaty. Ordered, That all Committees shall be dissolved on Friday at Four of Clock, that the Members of the House, that shall so please, may attend the Funeral of the Earl of Bedford. Ordered, That the Committee for Sir Lewis Dive be revived, as to the Election of Carnarvonshire only, and the Petitions that depend thereupon; and that they meet, on Friday next at Two of Clock, in the Court of Requests. That, for the Opening of the Ports, the sooner it is done, the better; for Merchants complain of it: They lose the Opportunity of their Voyage; and are at a great Charge, while they stay: They are of such Credit, that they will suffer no suspected Person to go in their Ships. To acquaint the Lords, that whereas they have, from us, received heretofore Informations of divers Probabilities, that this Kingdom, or some of his Majesty's Dominions, might be attempted from France; these Things continue under Suspicion still; which is the reason of the Shutting of the Ports. The Letters, that were to go into foreign Parts this last Week, they could not pass, by reason the Ports were shut. That, having Information of this, the Committee appointed by the Commons House for the weighty Affairs of the Kingdom, sent to the Post-Master; that when the foreign Letters came this Week, that they, together with the former Letters, should not be delivered, till he had further Order: And therefore to desire the Lords, that a certain Number of Lords of his Majesty's Privy Council, and Mr. Treasurer, a Member of this House, may have the Perusal of them; to the end that, if any of them concern the Safety of the State, they may make use of them; and that those which do not, may be resdelivered to the Parties to whom they are directed.